Have you ever come across any articles with the little lightning bolt symbol while scrolling down Google on the phone? Noticed the AMP letters next to it? Then you should pay more attention now as AMP is the incoming prime project that Google has been pushing all around. So let’s find out what exactly it is and how it can affect your Magento site. 1. What is Accelerated Mobile Pages (AMP)? Accelerated Mobile Pages (AMP) is an open source project to help create mobile-optimized web pages which can be loaded at a magnificently fast speed. And according to a report by Google at the end of 2016, AMP is loaded at a 4 times faster speed than the traditional mobile pages. 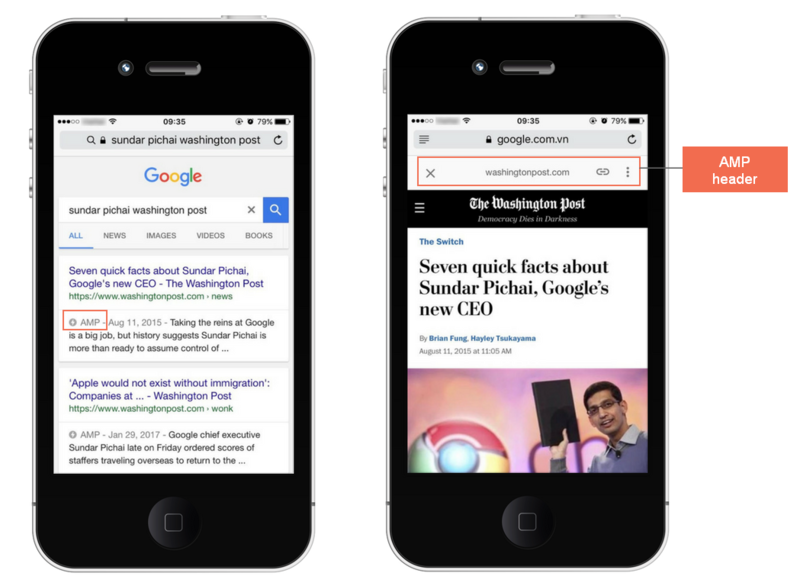 In February 2016, Google officially featured AMP pages into search results displayed on mobile. With more than 700 thousands domains publishing AMP content after 1 year such as eBay, Twitter, Pinterest.., it is proved to be the hottest talk of the town. The ultimate goal of the AMP project is to make the mobile-optimized web pages to be loaded as fast as they can. Faster means more users staying on your site. Hence, the developers at the projects are coming up with these innovations. – AMP HTML: This is quite similar to the regular HTML. But specific tags are no longer allowed. Developers can easily follow the AMP HTML required markup on the resources of AMP project. – AMP CDN: An optional Content Delivery Network, it will fetch AMP-enabled pages, cache them and automatically make some performance optimizations. From the above information, we know that it takes time and resources to create AMP version for your Magento site. You must wonder “Will it worth the money I have to spend.” Let’s go into details about what effect AMP can have on your online store. The first aspect is user engagement. 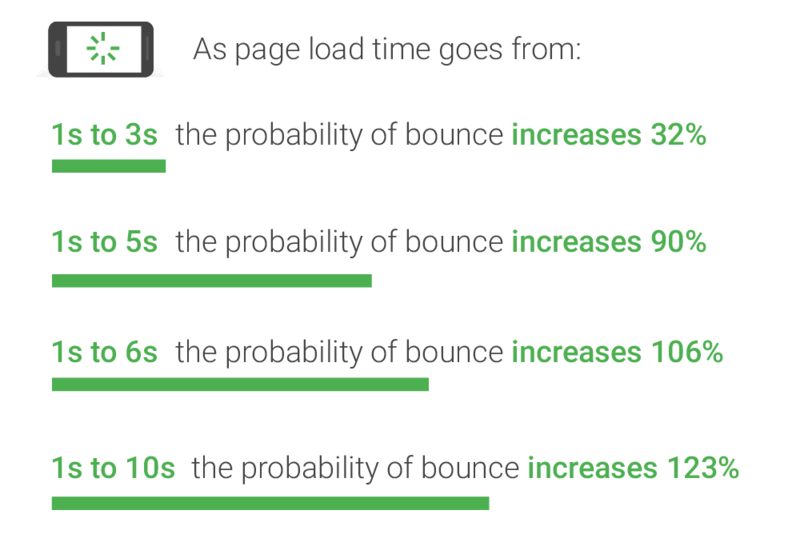 According to Google SOASTA Research 2017, the longer it takes to load a site on mobile, the higher it goes for the probability of bounce to happen. Hence, with AMP, the super fast loading speed is expected to keep more users stay on the site. And, following Google report on AMP last year, the partners launching AMP on their sites received a significant increase in mobile users. eBay, a prominent name in ecommerce, has launched over 8 million AMP pages so far. Second is user experience. In the time when people are becoming more and more attracted with their mobile and google everything they want to shop, AMP is a potential answer for better user experience when it gets rid of slow-loading and brings up a smoother scrolling. Also, ranking on search result page is also what may get affected as a result of higher engagement. If an AMP gets more clicks and fewer bounces because it’s faster to load, Google crawler determines that the page is valuable to users, and it’s likely to get higher placement in search results. AMP is still on its process of developing with improvements from developers around the globe. Hence, the final answer to its benefits is not yet to come. We are also on the progress of developing Google AMP Extension for Magento 2 which supports to create and customize AMP – Accelerated Mobile Pages for Homepage, Category Page and Product Page in Magento 2 as your need. You may want to check out for the advanced feature it offers. P/S: Our next article in the AMP series: Google AMP for Magento: Pros and Cons is updated! It gives a deeper insight into the advantages and drawbacks of AMP and whether a Magento site should launch it. Generally I do not read post on blogs, but I would like to say that this write-up very compelled me to try and do so! Your writing taste has been amazed me. Thanks, very great post.